Farming First is pleased to act as media partner for the Louis Malassis International Scientific Prize and the inaugural Olam Prize for Innovation in Food Security, which will be awarded at the Third Global Science Conference for Climate Smart Agriculture in Montpellier in March. Our new blog series will showcase stories from scientists nominated for these prestigious prizes. 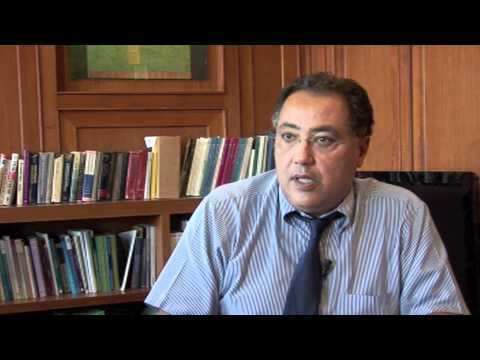 The fifth blog in this series outlines the work of the SRI International Network and Resources Center at Cornell University, known as SRI-Rice, nominated for the Olam Prize for Innovation in Food Security. For future global food security, farmers must be able to produce more food with fewer resources: less land, less water, less labor, lower energy requirements, and less environmental impact. Although world population growth has slowed, it continues; by 2050, only one-third as much arable land will be available per-capita as 100 years before. This decline in land resources is made worse by deficits in land quality – erosion, salinization, depletion of fertility. Similarly, the amounts, reliability and quality of water for agricultural production are diminishing. The SRI International Network and Resources Center at Cornell University, has been working to address these challenges through development and dissemination of the crop and water management system known as the System of Rice Intensification (SRI), and has been nominated for the very first Olam Prize for Innovation in Food Security. SRI was developed in Madagascar 30 years ago by Henri Laulanié and is now spreading around the world. SRI methods have been shown to increase rice yields by 20 to 50%, often 100% and even more, with 25-50% reductions in water and 80-90% less seed. 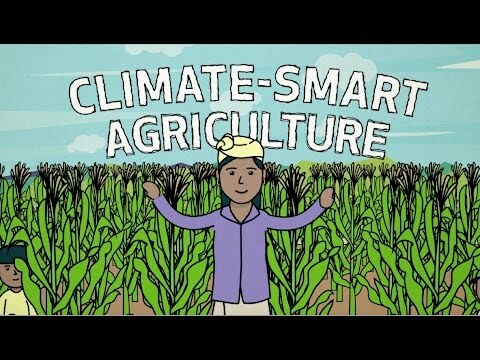 This video explains the techniques that have led to these results and the impacts they can have on food security, especially for resource-limited farmers. “As SRI rice plants have stronger tillers and larger, deeper root systems, they are more resistant to climatic and other stresses — pests and diseases, drought, flooding, lodging from storm effects. They are nourished and protected by enhancement of the beneficial organisms in the soil, ranging in size from earthworms to microbes. The benefits created by symbiotic bacteria and fungi are being documented by a growing body of scientific literature, including for human health,” he explains. 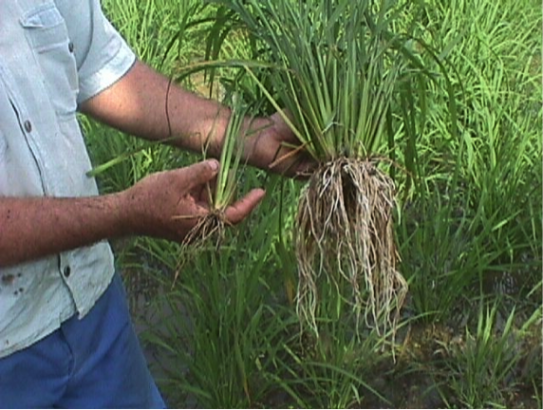 Two rice plants of same variety held by Cuban farmer Luis Romero. The plant on right was removed when 9 days old and transplanted into an SRI growing environment, with wide spacing, no continuous flooding of the field, and organic matter enrichment. The SRI effect has been reported now from over 50 countries, and in China, India, Indonesia, Cambodia and Vietnam, where SRI has had most government support, at least 10 million farmers are using most or all of the recommended methods on about 3.5 million hectares of land, with an average yield increase of 1.67 tons/hectare, using less water and having lower costs of production. “SRI methods qualify as ‘climate-smart agriculture’ and have many benefits particularly for women,” says Professor Uphoff. Beneficial impacts have been cited worldwide. For example, farmers in Haiti and Malawi have doubled their yields with SRI methods. A. Manonmani, a female farmer from Thenpaththu, a small hamlet near Tirunelveli in India, received record-breaking yields from her half-acre plot of land after she adopted SRI techniques, while C. Sethumathavan in Tamil Nadu has set a new world record with SRI practices. “SRI changes promote the life in the soil and capitalize on natural synergies between plants and beneficial soil organisms. Extensive research published in peer-reviewed journals shows how rice production can be made more productive, profitable, sustainable. This knowledge – coming from a widely dispersed, decade-long research effort prompted by the seminal work of Pere Laulanié – provides a scientific foundation for global food security in the decades to come,” concludes Professor Uphoff.